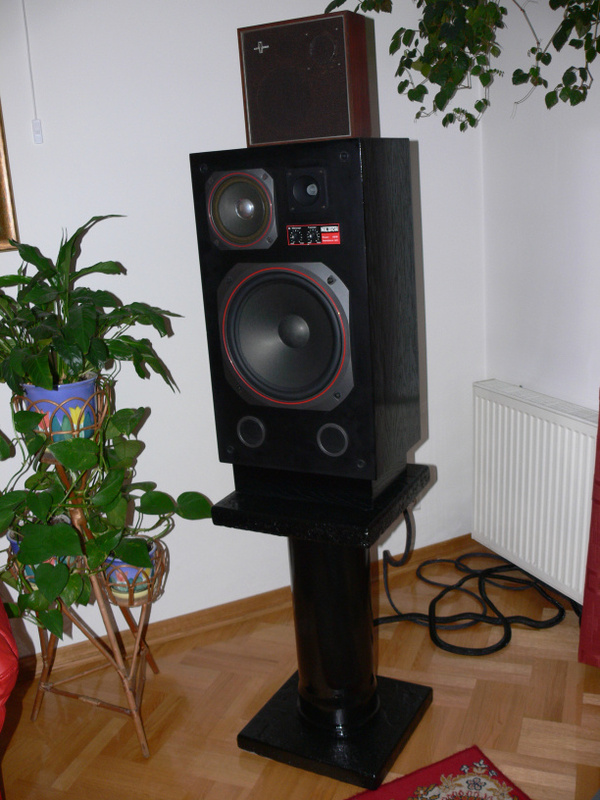 Solid Speaker Stands: Concrete + Pipe + Threaded Steel Rods + Sand ….. I would like to share with you an idea as to how to build your own Hiend-Audio Speaker Stands. I would also like to share with you my first impressions after listening to my own set of such Hiend-Audio Concrete based Speaker Stands. I built them myself, I use them, and the results are very satisfactory. So satisfactory that I need to write about it. Maybe you would like to test the idea and try it out in your Audio Sytstem too. In Poland we have these Castorama superstores, where you can purchase various building materials, construction materials, everything for the house and garden. We purchase four sidewalk concrete slabs (squares, tiles..), you know, ready pavement squares, each of a dimension 40 x 40 x 5 cm (their price is ~ 3 EUR a piece). We must ‘even out’ the rough corners and edges of these pavement squares, and do it with an electric angle grinder, equipped with grinding wheel suitable for stone. Once our pavement squares are even, smooth, nice and beautiful, we can remove the dust from them with a soft painters brush. Then we paint them to a black gloss color with any alkyd based paint, oil based, or similar paint. A pack of such paint is something like 5 EUR. Now tak the “Bottom Square” and drill three holes it it with a drill bit suitable to work with stone. ve dust, paint it black gloss oil paint (5 Euro per pack of paint), then dry well. The location of the holes on the tile is such that they are arranged on the edge of a circle, distributed every 120-degrees of angle. The diameter of this circle is slightly less than the inside diameter of the draining, or sewage pipe. I purchased such pipes in Castorama. They have a diameter of 200mm (preferably 250mm, but they didn’t have those on stock). I purchased two such pipes, each of a length of 0,5m. (price: 8 EUR). Length of these tubes, pipes, determines the height of your Hi-End Audio Concrete Speaker Stands. As for me – I found that these half meter lengths are just great. I found to be ideally what I needed. Nothing had to be shortened. I used them “as is”. Once we completed drilling the holes in the bottom tile, we do the same with the upper tile. Now we have three critical “construction elements” of our Hi-End Audio Concrete Speaker Stands: The lower tile (the base), the upper tile (the speaker table), and the pipe (the “stem”). All we need to do is to connect these three elements together. We do so by means of M8 threaded rods, which are also to be purchased at the construction / builders / house / garden Castorama superstore. I purchased six such threaded rods, they came in a convenient length of 1 meters each. Total price: 6 EUR for the six rods. We need six rods, because we have a stereo Hi-End Audio system, so we need two Speaker Stands, and each one has three rods to keep it one piece. Now we take the rods and put them through the holes drilled in the bottom sidewalk tile. We use bolts to fasten the rods to the tile, but we need to do this in such a manner, so that the endings of the rods are “hidden” in the concrete of the tile and to not extrude outside. We do not the rods to damage our floor in our house. So how to we accomplish this ? That the ends of the rods are “masked” ? Till now, we drilled “through” holes through the concrete tiles, with a drill bit of a diameter of say M10. NOW – we need to take a larger drill bit, one that is of a diameter bigger than our bolts, that we shall screw onto the rods. For me a drill bit of diameter 13mm worked well. Take this drill bit and make a small ‘cut-in’ from the bottom side of the tile, a cut-in into each of the “through holes”. CAUTION: you are NOT supposed to drill the full depth of the hole, but ONLY something like 0,75 cm, just enough so that your bolt, the one that you screw onto the M8 threaded rod, can “hide” inside of the concrete, but still has a “good grip” on the remaining 4,75 cm of concrete, which it is supposed to grasp, hold and support. Now we put our draining pipe on top of this. ( I use the word “draining”, because it sounds much nicer than “sewage” – but you get the idea J ). We put the pipe on the three rods, with the wider, ‘connector’ end facing downwards. In my opinion, the end product looks nicer, when the ‘wider’ piece of the pipe is at the bottom side of our Hi-End Audio Concrete Speaker stand. For me, it simply looks “nicer”. The upper concrete tile, also of the dimensions 40 x 40 x 5, is equipped with an additional hole – drilled exactly in the middle of the other three holes, in the “center” of the imaginary circle, a hole with possibly a large diameter, say 13mm. We already have such a drill bit, so we can use it. This hole will serve the purpose to pour sand or fine gravel into the inside of our pipe. I used fine sand, but I believe that fine gravel, with particles of a size ~ 1mm ~ 2mm would be even better. Just as we masked the holes from the bottom side of the bottom plate, drilling those “hiding” cavities for our bottom bolts, we now need to repeat this and do just the same from the top side of the top concrete tile. The purpose of this is that we have an even surface to put our Hi-End Speakers on it. Not all speakers have spikes, some need to have a flat surface to rest upon. Using the 13mm drill bit, we make the special “over-sized cavities” from the top side of the tiles, and again, the depth of the cavities should not exceed 0,75cm, or saying it in other words: not deeper than the thickness of our M8 bolt and washer, that are supposed to hide within the concrete tile. Ok. We are almost ready. But hey ! What about my beautiful floor, my wife asks … You will ruin my beautiful floor !!! … Well, not necessarily. Now we take thick felt material, such as the felt that some use to dampen the insides of Hi End Speakers. We cut out large squares out of this felt material. Say each square with a size of 10 cm x 10 cm. Yes. These are big feet. But the weight will also be big, so we want to distribute the weight of our construction on a possibly big area of your floor. Believe me, the floor will be happy. The wife will be happy. Everybody will be happy. So, now append the 4 felts, our soft ‘feet’, to the bottom of the bottom tile. Use any glue that you find appropriate for the task. Once you glue them on, you can simply press them down with the weight of our speaker stand. Just in case that the glue soaked and penetrated the whole thickness of the felt, put the whole thing on cardboard. Just in case. You do not want the glue to fasten your Hi-End Audio Concrete speaker stands to your floor…. Please do not ask how I know. I just … I know. I learned about this the hard way. 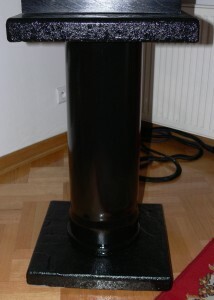 You can put a final layer of paint on your Hi-End Speaker Stands, putting especially big amounts of paint on the joint between the bottom tile and the bottom rim of the pipe. We want to make a sealed, hermetical connection here, so that the sand does not fall out though the small holes or irregularities on this joint. After putting the final layer of paint on the whole construction, and after it dries, you can put the Speaker Stands in your living room, put them in the most appropriate listening positions. ( for me – these turned out to be the positions where my wife protested the loudest ). But seriously – the place where the wife shouts the loudest – i.e. the place which is virtually almost the middle of the room – it is (believe it or NOT!) the almost optimal and correct for the speaker stands, at least from the point of view of acoustics theory. Optimal for the imaging of the sound stage. After the Hi-End Audio Concrete Speaker Stands are in their final positions – you can pour in the sand, and fill them up to the very top. Once you fill them up, it will be rather difficult to move them around, so think about it where you want to have them placed. Afterwards, they will be too heavy and not so easy to move around. I baked the sand in 230 degrees, for something like 1,5 hours. It takes fairly long time to heat up 40 kg of sand and to evaporate, get rid of the moisture out of it. After 1,5 hours of baking, you switch the oven off, and you need to wait 2 days for the sand to cool down. Yes, it takes a lot of time to cool down. So now, you have completely got rid of the moisture. The sand is very easy to handle now and it will not be a problem to pour it into our pipe via the small drilled M13 hole on the top tile of our HI-End Audio Concrete Speaker Stands. Wet sand is doubly bad because: a). It tends to stick together and hence it is impossible to “pour” it into the pipe via the small top hole through the upper tile, and b). you do not want to risk having moisture inside of the tube, because this could lead to mildew, or other problems. Better not risk it. When you have poured the sand inside of the pipe and filled it up, now you need to glue the top hole with some adhesive tape so as to cut off the contact with outside air and air moisture, which could penetrate inside of the pipe, through the moisture in the surrounding air. Our sand is dry. Let’s make sure it stays that way. NOW comes the big question: What is the listening experience? Is it at all possible to “hear” a speaker stand ? Does a HI-End Audio Speaker Stand make any “difference” ? Well, believe me, it DOES. My stands soud super. Well, not actually the stands, but the speakers on top of them. Archimedes, (287 BC – 212 BC), a famous ancient Greek mathematician, physicist, engineer, inventor and astronomer, once has remarked of the lever: “Give me a place to stand on, and I will move the Earth”. So, if we give our hi-end audio speakers a solid place to stand on … they shall move our souls. My high-end audio concrete speaker stands are now supporting my speakers, and the speakers sound just SUPER. I would definitely recommend that you build such speaker stands. The total cost of the project, in Poland, turned out to be somewhere around 40 EUR, give or take. OK., ok., with the cost of the paint and the delivery of the sand (door to door service ). It turned out to be something like 50 EUR. I would be happy to hear your questions and comments. Or maybe alternative finishing ideas. If I find a way to append photos to this new web site, I shall provide you with photos of these speaker stands of my creation, so that you can have a look at them. Oh, and … the question was, how did my woman come to terms with all the confusion whilst executing the project …. Oh well. I had huge problems were. Especially in the early phase, when I went out shopping and ‘purchased the raw materials’. She just could not possibly understand what I am doing. She wanted to make an appointment at a psychiatrist, and was very concerned about my mental health. But now, when the project is now completed, or even earlier, when the ready Hi-End Audio Concrete Speaker Stands were drying in the sun on my balcony, the level of acceptance was much higher. She even was willing to discuss the color of the paint that “we” choose to finish them. I was not particularily interested in the rose or lila colors. Finally, I managed to pursuade my woman that the black color fits anything, just as a black womans hand bag fits any dress, skirt or other women’s outfit. Perhaps it is the “every mother loves it’s children” syndrome, but …. … but it seems to me that there is much more precision in the location of instruments in space. Now I can close my eyes and point my finger to the guitar, the drums, the percussion. Close your eyes and you shall SEE. Perhaps this is due simply to the fact that now “medium” and “high” speakers radiate towards me from a higher position, directly “in my face” … or in other words, are positioned at the height of my face and ears. Thus, the angle of propagation can be slightly smaller, close to zero. I am now listening virtually “on axis” – right in front of the mid-speaker and the high-tweeter. I do not if a person is able to hear such difference or not, but judging by the circular propagation charts, the angular radiation efficiency of many transducers, I suppose it can make a difference. 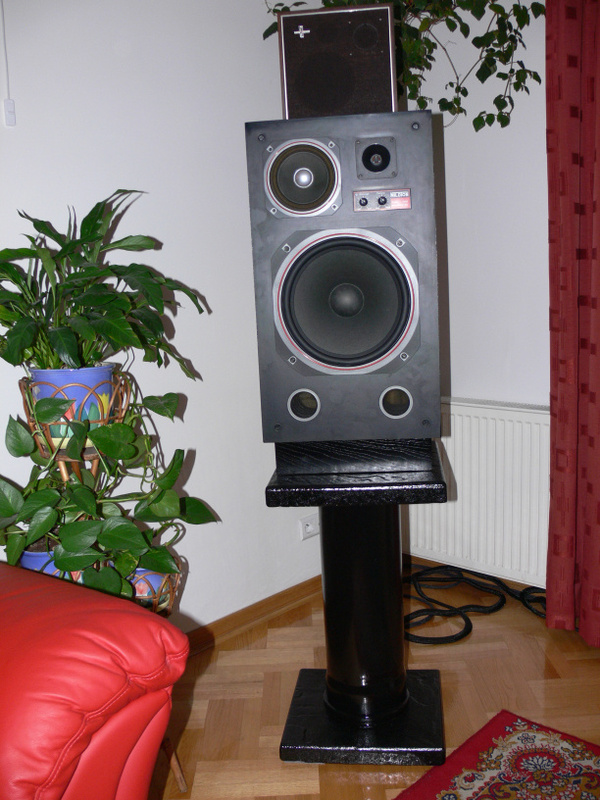 It is not the same if you place you HI-End Speakers on the top of some feeble and shaky dresser or on a shelf …. Such “supports” are very unsupportive for the quality of the sound. Everything is vibrating, shaking, the speaker do not have “solid” and “unmovable” support. Various resonances arise, and all this muddles the sound. 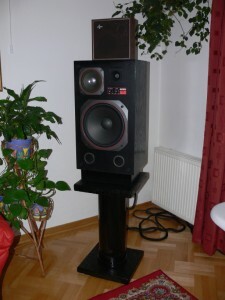 To sum up – I spent no more than 50 EUR for a pair of these Hi-End Audio Concrete (and sand) speaker stands. I sweated a bit, I forced my electrical tools a bit, but I think that it was worth it. If I could hear such great differences in the perception of sound on not-so-high quality speakers, just imagine, what a difference these stands will make for you, as I assume that you have the very best state of the art. Speakers. Your comments, questions, be it technical execution details or otherwise, alternative approach ideas – all are kindly welcome.